Successfully sharpened points at last! Ever since I started using Caran d’Ache Museum Aquarelles as my daily-carry colored pencils, I have been on the hunt for a portable sharpener that accommodates the Museum’s slightly larger-than-average barrel. At home I can use my trusty electric Bostitch or even a knife, but on the street, my choices are few. For the past couple of years, I’ve been using a KUM 2-hole that is serviceable, but not ideal: While one of the holes fits, it’s a bit wobbly, so I must be careful or the point will snap. Still frustrated, I put a portable sharpener on my relatively short sketch material wish list a year ago. A while back I tried writing directly to Caran d’Ache. Reminding the Swiss company that not all users of their products work in studios with access to desktop sharpeners or knives, I asked for a recommendation for a portable sharpener that would accommodate their premium artist-grade pencils with larger barrels, Museum and Luminance. I didn’t receive a response. 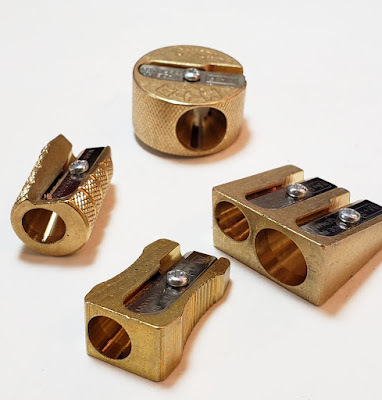 Undeterred, I tried contacting the company a second time a few weeks ago, and this time I did get a response: I was referred to the Mobius + Ruppert (M+R) line of brass portable sharpeners. 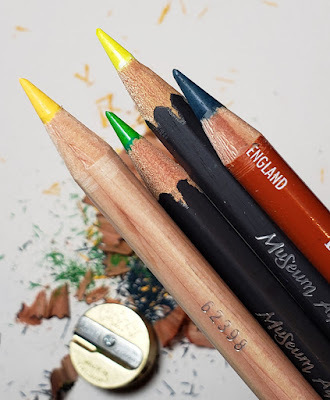 Although I have tried many portable sharpeners in my quest, this series had been off my radar because I assumed they were designed for conventional-sized pencils. The German-made sharpener comes in four styles. As a bonus, the blades are replaceable. First I tried the double-hole round version, which was a personal favorite of the rep who responded to my inquiry. With expected robust German build quality, the sharpener looks like it could be run over by a tank unharmed. I have tried so many sharpeners with dashed hopes that I was entirely skeptical when I stuck my first Museum Aquarelle in the recommended smaller hole (the larger is designed for use with charcoal, crayons and other chunky materials). It fit comfortably and securely – no wobble. Could it be . . .? Yes! The grail I had been searching for! Museum Aquarelle, Luminance, Derwent Drawing Pencil – all pencils with larger-than-standard barrels – all sharpened beautifully! Look at those points (see top of page)! You can imagine what I shouted! Hallelujah? No – ouch! 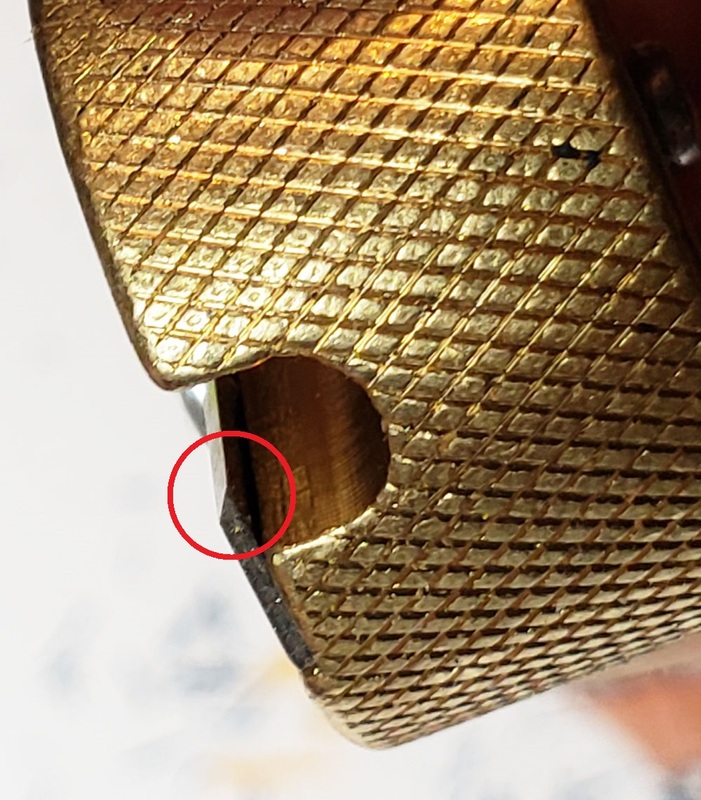 On the far end of each hole, the blade extends just far enough past the sharpener’s edge that the blade’s corner is exposed – and that corner happens to be exactly where I need to hold the sharpener while sharpening. 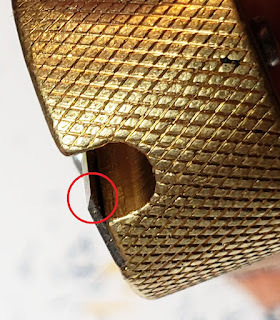 Since no pencil would reach the opposite end of the blade due to the sharpening cone’s angle, there’s no need for the blade to extend past the sharpener’s edge. After nicking myself twice, I complained to my handy Spouse Guy, who came to my rescue with a Dremel and file. ends of the pencil holes. 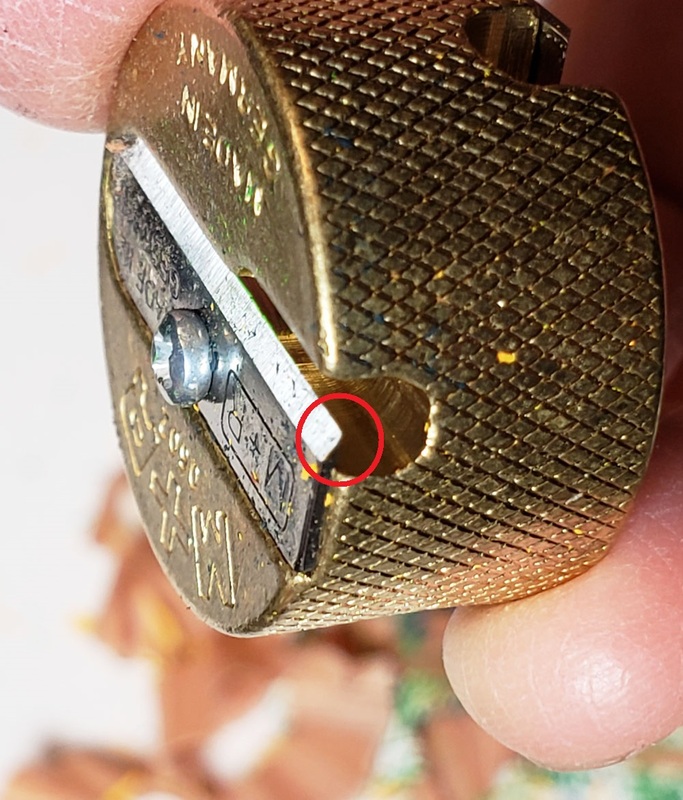 For an $8 sharpener, you’d expect to be able to use it without injury. I wondered if the design I chose was particularly faulty – the two blades lie perpendicular to each other, so it’s especially awkward to hold without encountering the dangerous points. Since I like to have multiples of anything useful, especially grails (one for my bag, one for my desk, one for the kitchen where I sketch birds at our feeder . . .), I decided to spring for the other three models, too. Although all three of the other models – the single- and double-hole wedges and single-hole grenade – are easily held without coming in contact with a blade corner, I gingerly felt the edges, and they all have the same design flaw: The blade corners are exposed. Reaching into a bag pocket could still result in a nasty surprise. 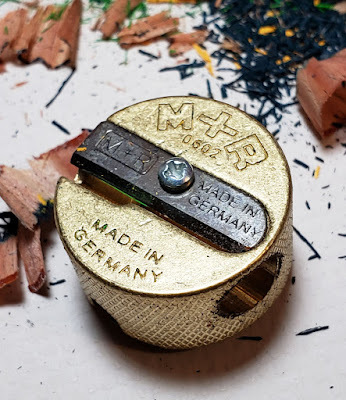 Without doubt, the M+R sharpeners are keepers. They are the best portables I’m likely to find for my difficult-to-sharpen Museum Aquarelles, and I’m happy that they are built ruggedly. I’d advise filing the blade corners before using. Who knew that drinking from the grail cup could cut a lip?